There’s something happening in New York City. New York Tech Meetup just announced they will be presenting hack demo at every one of their sold out events, New York’s first Music Hackday is hitting this weekend and it will be quickly followed by Foursquare’s first hackday the weekend after. Did the TC Disrupt Hackathon prefigure a growing trend here in the Big Apple? This past weekend Columbia students demoed their best hacks, concluding their week-long DevFest 2011. Students had a week of workshops from local startups like Foursquare, Aviary and Bit.ly. The results were team hacks for everything from Facebook-generated birthday cards to time-sensitive, class-based messaging systems. Demos were presented to an audience that included New York startup luminaries including Fred Wilson, Chris Wiggins, Dave Jagoda, Steve Jacobs, Justin Singer and Thatcher Bell. 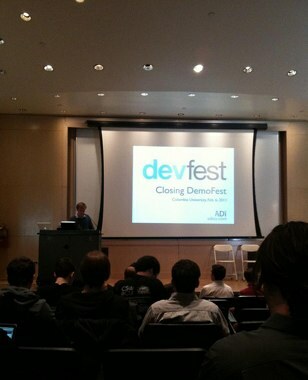 Here are some of our favorites from DevFEst 2011. CU Board – Moses Nakamura, Andrew Hitti, Ephraim Park, & Mark Liu. A brilliant and potentially disruptive (for better or worse) idea for the classroom. Modeled on the anonymous boards in 4chan, the idea is to create discrete, time sensitive, open chat rooms tied exclusively to a class and only for the duration of a class. An online, digital note-passing system of sorts that gives students a voice and instructors an unvarnished, real-time view of their lecture. CU Generals – Jacob Andreas. Inspired by the university’s existing “assassins” game, Andreas created a mobile web implementation that allows for team play and ongoing campaigns. The game uses location services to ensure that users have to actually run around campus to play and win. Excellent UI and gameplay for one dev over a week, new users were signing up and playing while the demo was happening. Campus Walkabout – Benjamin Ludman, Jordan Schau & Eli Katz. A smartphone web app to give guided campus tours, Campus Walkabout allows prospective students and family to go at their own pace and cater walks to their particular interests (e.g. the campus history tour or historic building tour). Allows for community generated content and would scale well to other campuses. MatchU.me – Cole Diamond – A kinder, gentler HotorNot, students browse pictures and decide whether they want to be matched. If two people are matched they can facilitate a meeting. Chinese OCR – Ben Mann – Chinese OCR is an Android app enabling you to take a photo of Chinese text and translate it quickly into English. Tangible Ecards – Jason Chekofsky – Presented as wireframe sketches, Tangible E-cards is a simple idea – give facebook users a chance to mail real birthday greetings to their friends a week before their actual birthday. HackBoard – Sid Nair & Kui Tang – An online web community to form and show off projects you’ve worked on. Daily Focus – David Hu & Vivek Bhagwat- An online photo scavenger hunt and group querying system. Zesty Markets – Howie Mao & Samantha Diamond – An e-marketplace platform for niche markets.